Incredible 2 bed, 1 bath condo in the heart of Center City! 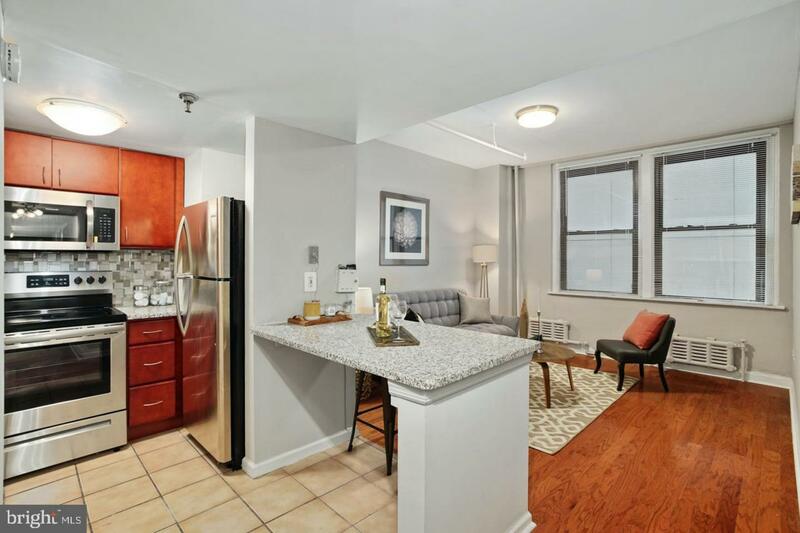 This spacious and gorgeous unit is situated just off of Center City's Avenue of the Arts. The Arts Condominium offers endless options of some of the best restaurants the city has to offer, theaters, universities, museums, galleries, boutiques, parks, The Kimmel Center, Academy of Music and so much more all within walking distance. As you enter the building, you are greeted by the 24-hour front desk concierge service and the newly refurbished grand lobby. Located on the 2nd floor, this is only 1 or 2 total units in the entire building to offer 2 bedrooms! As you enter the unit into the vestibule area, you are greeted by warm wood floors and two hall closets for your coats and storage. The living room is spacious and also features wood flooring. The dining room table is a built-in granite peninsula offering efficiency and ample seating for up to 5 people. The kitchen includes cherry wood cabinetry, granite countertops, with stainless steel appliances including a built-in microwave. The first bedroom is large and offers a good size reach-in closet. The second bedroom is also spacious and offers a nook for the perfect office space as well as a deep large closet. The full bathroom also offers great space with a soak-in tub and a pedestal sink. The building offers additional amenities such as the fitness center, on-site laundry facility, 24-hour lobby attendant, pet-friendly environment, and cable ready units. This unit is a walkers paradise with an incredible Walkscore of 99, and a rider's paradise with a Transit score of 100! The association fee includes alarm system, cable TV, common area maintenance, electricity, gas, heat, building insurance, management, sewer, snow removal, trash, and water. Additional amenities include 24/7 concierge, elevator, exercise room, laundry facilities, meeting room, and security. Schedule your showing today!